I recently had the opportunity to spend some time at the ocean and realized what a powerful metaphor it is for my life. I attended the Creative Business Retreat by the Sea led by the amazing Laura West of joyfulbusiness.com. For me, the ocean was an important part of the retreat, a strong metaphor for how I want to show up in my business. The ocean has an expansiveness, energy, power, beauty, and magnificence which speaks to me on a deep level. As I walked barefoot in the sand each morning, I noticed the changing face of the ocean. Most of the time, the waves were strong and powerful crashing up against the shoreline, bringing precious gifts from the sea. Other times, the waves broke before coming to shore. The beach was covered with bits and pieces of soft shell crabs and a plethora of seashells. 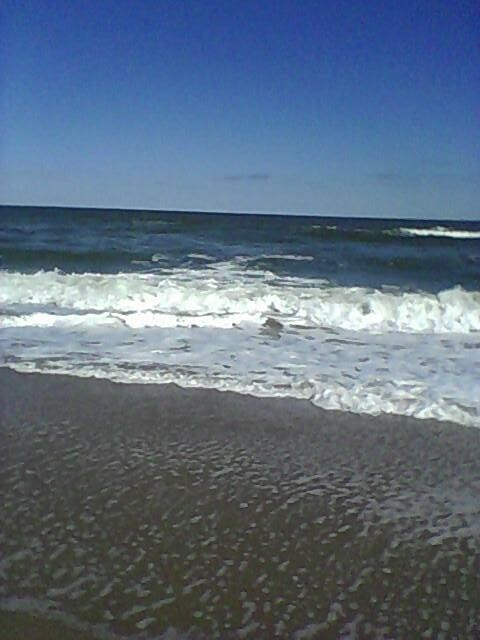 The sea-gulls and sand pipers playing in the waves were a delight to watch. One day we even spotted dolphins splashing, spraying, and playing as we stood on the deck of our beach house. Magical! Visiting the ocean, was powerful on so many levels and I will miss her. Until we meet again, my friend. What about you? Do you have a totem, symbol or metaphor that holds a special significance for you? Please feel free to share what it is. I would love to hear from you! I too love the ocean! It reminds me that as it is ever-changing, so do I have the power to morph and be what I want to become…thank you for your vivid writing that had me right there on the beach too!